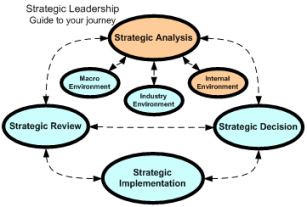 The internal analysis is traditionally the third and final section of your strategic analysis and can be completed at corporate or tactical operational level. The corporate level internal analysis is about identifying your businesses value proposition or core competencies. These are sometimes referred to as your core capabilities; strategic competitive advantages or competitive advantage these terms all represent essentially the same thing. If you review the insurance industry you will see that banks offer insurance to their customers – it would be hard for a non bank insurance provider to replicate the combination of offering loans and insurance together, also the local auto club may offer insurance, again a non auto club would not be able to replicate the combination of auto club and insurance. (Add some from text book) In the bank & insurance example the bank would find that they have an unique position over most of the insurance industry, which is great, but next they would need to look at what they do better than other banks that offer insurance. I was appointed to the role of operations manager in a timber mill, in the first year the business was facing liquidation so there was a need for change, to engage the staff I actively promoted the quality of our input raw material to the employees, (we used 30 year old plantation timber where most of our competitors used 12 year old plantation timber), which helped build pride in the business and our products. Later when I started meeting customers I found that they really did not care that our timber was from older trees. This is a good example of a unique quality that is not valued by the customer. I eventually found our niche: Our machinery was older than our competitors and did not include automated packaging, we found that as we were packaging materials manually we were able to package the product in different size packs to suite difference customer requirements – this worked out to be an excellent niche. What makes a good leader Download Center – strategic planning template internal analysis. To develop a value proposition using the resource model you will identify the resources that your firm has or that exist in your industry (with your competitors) then you compare your organizations competitive strength to that of your competitors. Essentially where you have the largest strength becomes your value proposition. Rate how your business compares with your competitors on each of the identified characteristics using a simple scale, suggest -3 through +3. (Zero is equal to, positive is better than, negative is worse than). Summary: Due to our manual packaging we are able to offer packs sized to customer specifications; where the larger mills with automated packaging have to stick to one preset size. This is our single strategic competitive advantage. (NB: We became the largest supplier of high margin timber products by leveraging this advantage. ).